New book is an examination of the true meaning of the Sabbatical years, its ways and importance of keeping it. In 2008, Joseph E. Dumond created a DVD explaining the Sabbatical years and the curses for not keeping them. In 2009, he wrote The Prophecies of Abraham which shows the prophetic messages in the lives of Abraham, Noah, Joseph and Jacob in the context of the Jubilee cycle. These two projects made him aware of how little people knew about the Holy Times according to the Bible. 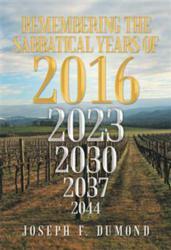 In his incisive new book, Remembering The Sabbatical Years of 2016, he elucidates the essential aspects of the Sabbatical years and when and how they fit into prophecy. Dumond learned about the Sabbatical cycle sometime in 2005. In his desire to share his discoveries, he began teaching others about the importance of understanding God’s timing of his prophecies. Remembering The Sabbatical Years of 2016 is also an extension of his efforts. In it, he dispels every false teaching about the Sabbatical years while simplifying what may have been otherwise a very complicated subject. Dumond’s edifying work will let readers gain a better understanding of the Sabbatical years, when they occur, why they are important to know and, most importantly, how they can be kept. “In order to understand the truth, you have to expose those things that are not true. What is left is then the facts. Remembering the Sabbatical Years examines all the theories put forward as to when the Sabbatical years were and then using your own bible shows you how to be able to prove it for yourself. Once you do this then you too can understand prophecy and in what season the Messiah is to come,” he shares. Filled with groundbreaking insights, Remembering The Sabbatical Years of 2016 is both a source of wisdom and practical knowledge on an important yet complex subject and a necessary guidebook for prevailing through today’s times. Joseph F. Dumond was born and raised Catholic since 1958 and changed to keeping the Sabbath and Holy Days in 1982. He began to study from a Torah mindset in 2005 after he learned about the sighted moon to begin the month. At this time, he started learning about the Sabbatical years. It was also in 2005 that he began to teach those who would listen about this important understanding of God’s timing of His prophesies.